China's central bank allowed the yuan to drop sharply against the U.S. dollar again on Wednesday, sparking the currency's largest two-day decline in decades. The move comes one day after the People's Bank of China shocked markets by changing the way the yuan's daily trading band is calculated, and executing a one-time devaluation of the currency. The PBOC sets a daily midpoint for the yuan, around which the currency is allowed to trade within a 2% band. Until Tuesday, the central bank had total control over where the midpoint was set. Going forward, the midpoint will be based on the previous day's closing price. In a sign that China is following through on its plan, the central bank set the yuan's midpoint at 6.3306 on Wednesday -- 1.6% weaker than the previous day's midpoint, but near where the currency last traded. 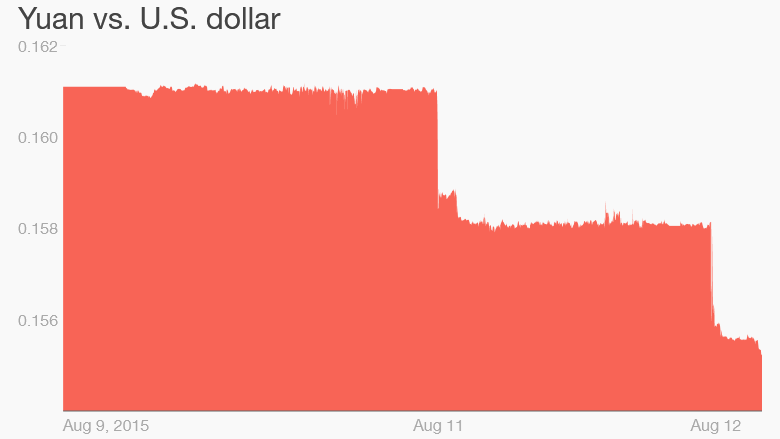 That follows a 1.9% devaluation of the yuan on Tuesday, a move that set off a major sell off on Wall Street. The PBOC, in a statement issued Wednesday, said it would work to keep the exchange rate "basically stable" and that there was "no basis" to believe the yuan would "persistently depreciate." Even with the central bank's reassurances, the yuan traded as much as 1.9% lower against the dollar on Wednesday. The currency mounted a mild recovery during late afternoon trade. The Wall Street Journal reported that the central bank had intervened, and instructed state-owned banks to sell dollars in an effort to stop the slide. "We expect [the PBOC] to act behind the scenes in the coming days, most likely via [forex] sales, to help stabilize expectations for the currency," analysts at Capital Economics wrote in a research note. The dramatic devaluation is likely to draw intense criticism from some quarters. The U.S. has long accused China of keeping its currency artificially low, instead of allowing it to move freely in foreign exchange markets. A weak currency cheapens the price of a country's exports, making them more attractive to international buyers by undercutting competitors. If other nations in the region also decide to devalue their currency in response, it could leading to so-called competitive devaluation, also known as a currency war. China says the policy change was made in response to market forces, which will be allowed more control over the currency in the future. 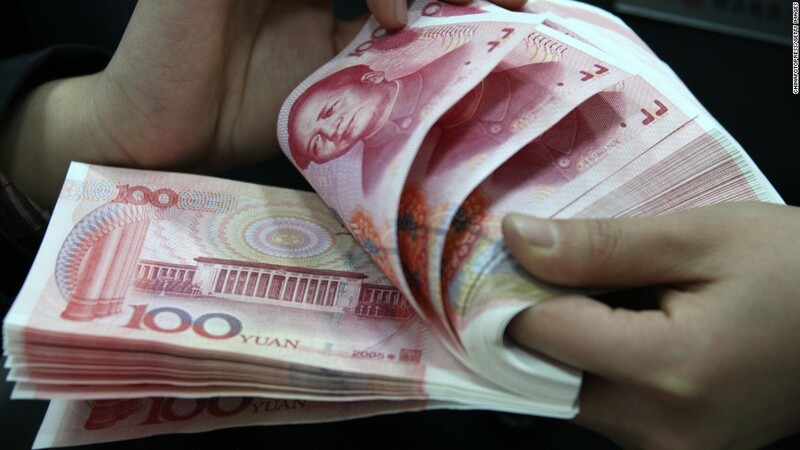 "The reform of [yuan] exchange rate formation mechanism will continued to be pushed forward with a market orientation. [The market] will play a bigger role in exchange rate determination to facilitate the balancing of international payments," the bank said in a statement on Tuesday. Market-based reforms will boost China's campaign for the yuan to be included in an elite grouping of currencies used by the International Monetary Fund. China has expressed interest in having the yuan included in the IMF's Special Drawing Rights basket, which the organization uses to value reserve assets. The basket currently includes the dollar, euro, British pound and Japanese yen. Inclusion in the the IMF's currency basket would lend significant prestige to the yuan, which is being used more and more frequently to execute international transactions and payments.